Analysis: Why the sudden turnaround? OXFORD, Ohio – One of the more captivating things about hockey is how teams that appear dead on the frozen water at one point of a season can quickly reverse that negative trend. 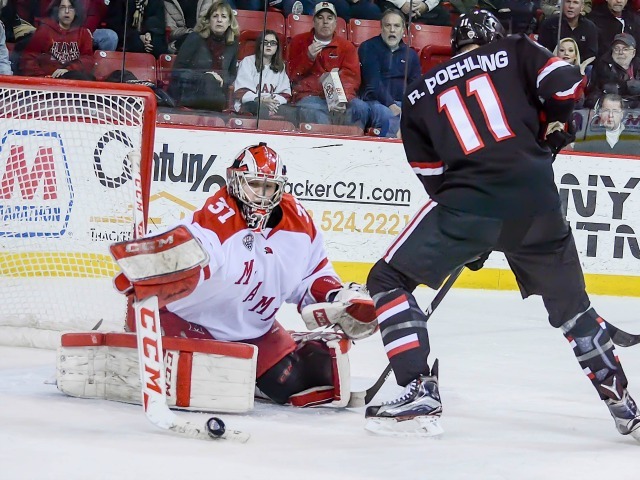 The Miami everyone wanted to play in November and early December has made a significant move in the conference and PairWise the past month, as it won its fourth straight game on Saturday, 4-1 over St. Cloud State at Cady Arena. The RedHawks (7-8-5) were in last place in the NCHC after their 10th straight non-win on Dec. 9 and dipped as low as 42nd out of 60 teams in the all-important PairWise Rankings, which determine at-large bids to the NCAA Tournament and seeding. Thirty days later, Miami has shifted into a tie for fifth in the conference and is a point away from fourth. In theory the RedHawks could move as high as third with a pair of wins next week. MU is up to 28th in PairWise and has much work to do to warrant at-large consideration, but the team is still up 14 spots in a month with plenty of hockey remaining against high-quality opponents. – Health. A young Miami team already lacking a ton of depth couldn’t catch a break in this department the first 16 games. Carson Meyer, Louie Belpedio, Ryan Larkin, Jared Brandt and Josh Melnick – all major contributors on RedHawks Version 2016-17 – missed a combined 15 games with various injuries and illnesses. All are currently healthy now and playing at a high level. – Third-period turnaround. As documented previously, Miami was outscored, 14-3 during its 0-7-3 run in the third period. During their winning streak, the RedHawks have netted 11 goals in the last frame. Opponents: 2. They’re finishing stronger and appear in better shape than earlier in the campaign. Miami found ways to lose games it led the first couple of months and now is pulling them out late. – Power play. With plenty of minutes under its belt as a unit, the Belpedio-Melnick-Anthony Louis-Kiefer Sherwood-Meyer group has impressed with its puck movement, and after going six straight games without a goal on the man-advantage (0-for-19), Miami is 4 of 13 (30.8 percent) in the three contests since. – Melnick on fire. The sophomore scored one time in the first 16 games but has found the net in four straight, netting five goals and setting up another in that span. That includes two overtime winners and the tying goal on Friday. He wins the hardest-to-figure-out-how-he-scored award, as after watching his Saturday goal live and several more times on replay it was still unclear how the redirected the puck in. Both OT goals were highlight-reel quality but also required slow-mo. – Confidence in other forwards. Forgive if anyone is left out, but among freshmen, Gordie Green is getting better every game, so is Willie Knierim. Alex Alger is a solid fourth-line pest, and Karch Bachman has a great shot and better speed, and he has huge upside. – Defense is a little more stable. Miami isn’t quite where it was last season, but that’s because Matthew Caito and Taylor Richart were about as steady as it gets in the NCAA in terms of shut-down D-men. With their departure the returning blueliners are higher in the depth chart consistently facing better forwards, and it’s a tough adjustment. But Grant Hutton, who was so strong as a freshman, is becoming more consistent, and Grant Frederic continues to improve and has been better about staying out of the box. The RedHawks allowed 90 shots in a weekend series in Denver – remarkably tying both games – but has surrendered an average of just 24.0 in the eight games since and had outshot opponents in seven straight before Saturday’s game. – Sherwood is taking over portions of games. There are times now when no one can take the puck away from Sherwood, and he’s exponentially tougher to defend with his passing game evolving. His double-clutch before sliding a pass through to Green for Miami’s second goal on Saturday is a prime example: Teams can no longer play for that lethal shot from the left faceoff circle. The NCHC clearly has the scouting report on Sherwood’s happy zone, but he is moving around on power plays and inflicting damage elsewhere, having adjusted to the conference’s adjustment. And he scored the RedHawks’ first shorthanded goal of the year to open the scoring. – And of course, a little puck luck. As everything seemed to be going wrong for Miami, that intangible made things worse at times, as the RedHawks hit posts and were victimized by bad bounces. The Hockey Gods appear to be balancing things out recently, as opponents are drawing iron and not getting breaks they were the first couple of months. FORWARDS: B. This corps scored a goal shorthanded, at even strength and on the power play. The forwards really didn’t generate a ton of chances, but they cashed in on the Grade-A opportunities. And St. Cloud State always seemed to have sticks and bodies in the shooting lanes. If we had to nit-pick, the bottom two lines didn’t do a whole lot and haven’t scored much all season. We could also mention that 12 forwards managed just 17 shots and a few were weak one at an idle goalie. DEFENSEMEN: B. It’s been a gradual process, but the blueliners are getting beaten less often than in weeks past. The Huskies entered this weekend averaging nearly 3½ goals per game but had limited chances and just one marker in this game, thanks largely to this group. This was one of Hutton’s better games, and he added the cherry on top with the ENG in the final minute after intercepting the puck at center ice. Scott Dornbrock blocked five shots. Ryan Larkin makes one of his 28 saves on Saturday (Cathy Lachmann/BoB). GOALTENDING: A. Notice how goaltending wasn’t mentioned before. The reason is that Larkin has been steady throughout, and without him Miami would not have seven wins. That said, he was even better than usual in this game, stopping 28 shots, with his lone blemish being a heat-seeking laser off a drop pass. Larkin faced some difficult shots but as is his MO allowed a very limited number of rebounds. LINEUP CHANGES: Same six on D, same goalie, just one change up front. Carter Johnson was scratched for the first time this season in favor of Alger. With four straight wins and the team playing its best hockey of the season, the lineup card probably won’t change a whole lot. Posted on January 8, 2017, in 2016-17, analysis, St. Cloud State Huskies and tagged 2016-17 miami redhawks, analysis, grant hutton, josh melnick, kiefer sherwood, NCHC, ryan larkin, St. Cloud State Huskies. Bookmark the permalink. Leave a comment.